TroopWebHostCS now supports the new Lion Cub program for kindergarten-age boys. 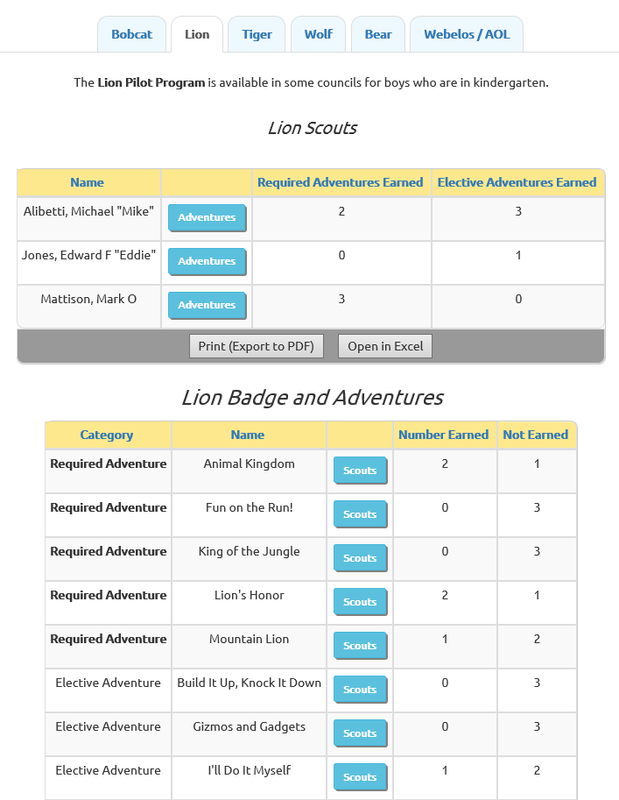 You'll find all the new adventures, badges, and awards under the new Lion tab. TroopWebHostCS and TroopWebHostGS have a new report that shows all of a scout's achievements since they joined scouting. 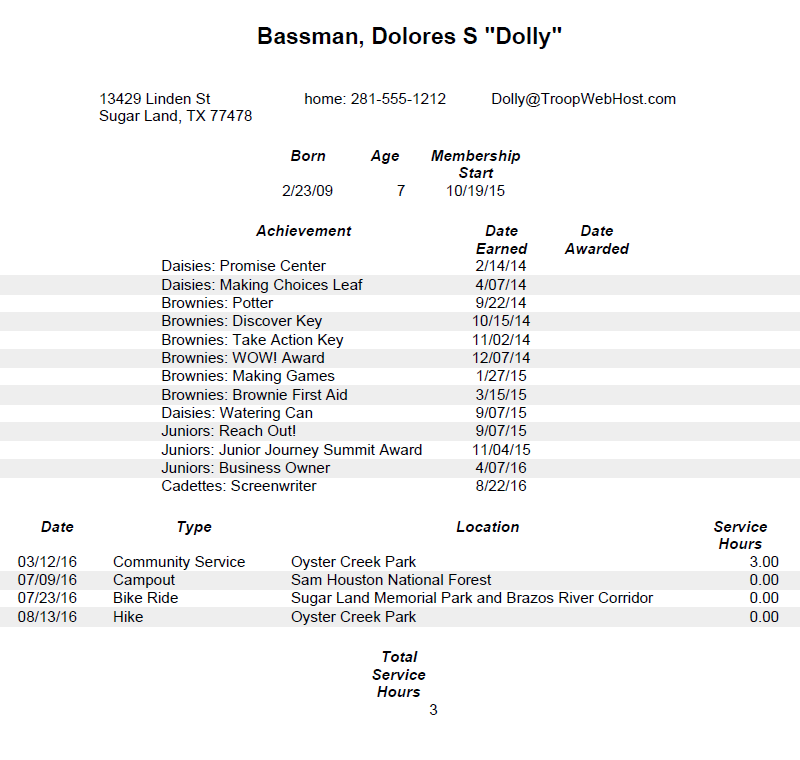 The report lists all of the adventures, journeys, badges and awards earned at each age level. It also includes a complete history of this scout's participation in past events. 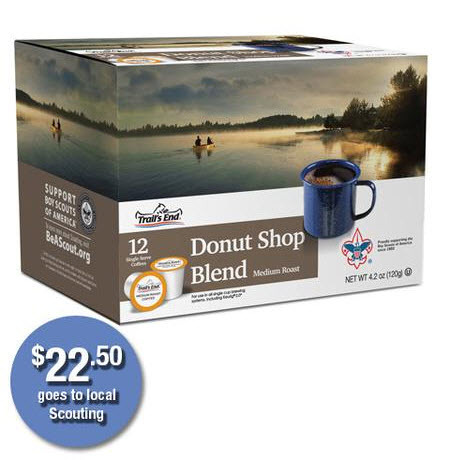 Cub Scouts access this report by clicking on this scout's Adventures button. Girl Scouts scouts access it by clicking on this scout's Achievements button. 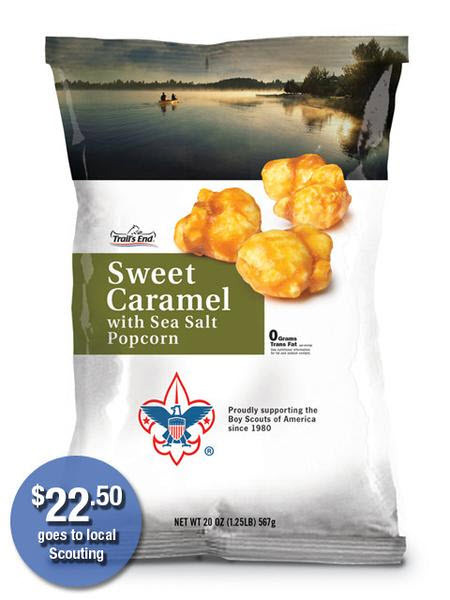 Boy Scouts and Cub Scouts can use our Sales subsystem to manage this fall's Popcorn fundraiser. 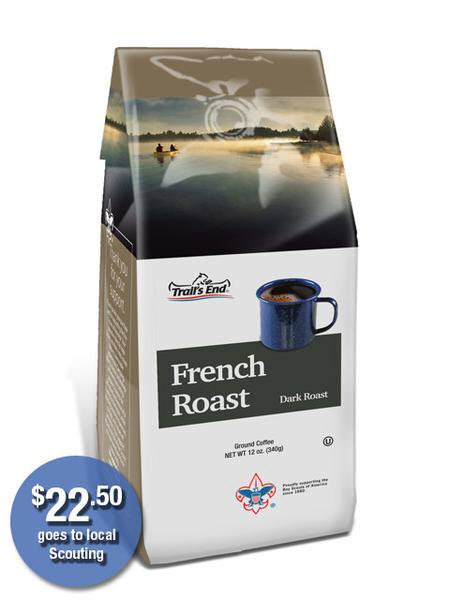 When you set up your new sales campaign, download the latest product information using the Add Merchandise From National Campaign button on the Items For Sale tab. The list of items now includes eight new products released this year. Once you download the National Campaign items, be sure to review the list. You will need to remove items not offered in your area, and update the prices to reflect your local offerings. Boy scouts have always been able to view the details of their rank advancement from the My Rank Advancement page on the My Stuff menu. 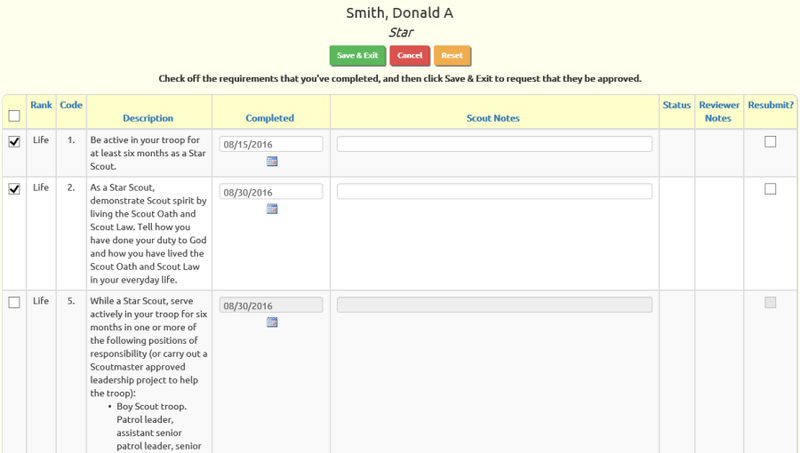 Now that page allows them to indicate rank requirements they've completed and request sign off by the troop's advancement leaders. They simply check off the requirements they've completed to submit their request to your advancement leaders. In similar fashion, scouts can also request sign off on merit badge requirements. 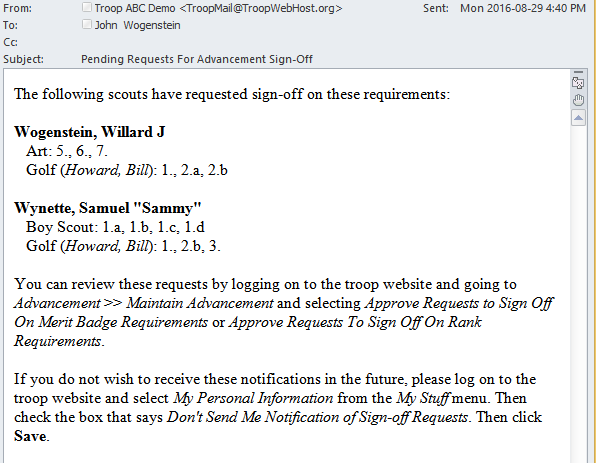 The system can notify you if scouts have submitted requests for sign off on rank and merit badge requirements. These notifications will go to every user who is authorized to update advancement information. Merit badge counselors will also receive a notification if any of the scouts they are assisting have requested sign-off on one of their badges. The notification will only be sent if there are outstanding requests that have not yet been approved or denied. Go to Advancement → Maintain Advancement → Automated Requirements Completion to schedule the day on which this notification will be sent to members of your troop. Note that if you schedule it to go out "Every Day" recipients will receive a message every day there are outstanding requests on the list, even if none have been added since the previous day. These two pages work in the same way. The Rank Requirements approval page is illustrated below. The page will display all requirements for which any scout has requested sign-off, which have not yet been approved or denied. 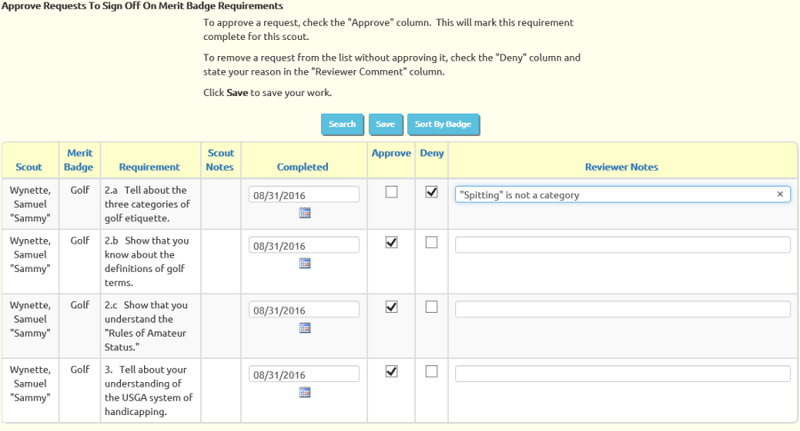 If you wish to mark the requirement complete, click the checkbox in the Approve column. Any comment you enter in the Reviewer Notes will be written to the notes for this completed requirement, along with the scout's comment that was entered in Scout Notes. If you do not agree that this requirement has been completed, check the checkbox in the Deny column, and indicate your reason in the Reviewer Notes column. The scout will be able to view this comment. Click Save to update the database with your decisions. Any request that you marked as approved or denied will disappear from the list. If you would prefer to see the list sorted by rank and requirement, click the Sort By Rank button. 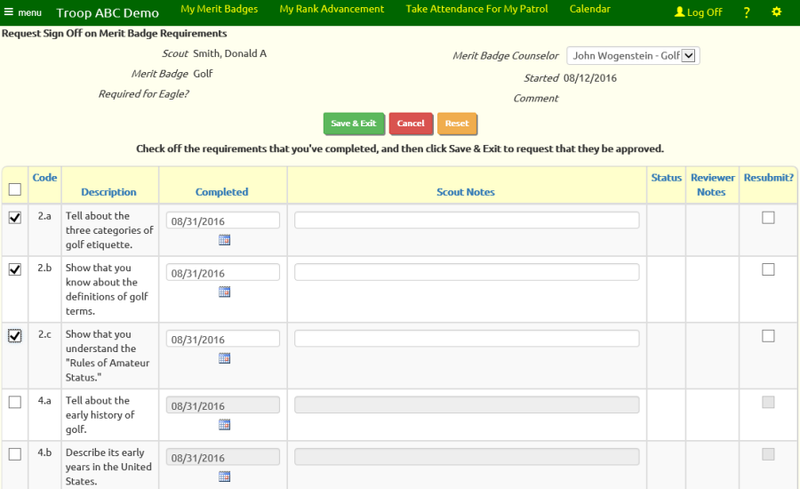 Merit badge counselors have a similar page, but it is limited to requests from scouts who they are assisting on badges. Search Engine Optimization (SEO) is the process by which you make your site more visible to other users when they are searching for similar sites. We've added a tab to the Site Appearance page (on the Site Configuration menu) to help you with this process. While success is not guaranteed, if you follow the instructions on this page it may improve your site's search rankings. Click here to visit our new Facebook page. We will add posts to this site as we deploy new enhancements throughout the month, so by liking us you'll learn about new features as soon as they come out. Please do not post support questions or enhancement requests to our Facebook page. These should still be sent directly to us at CustomerSupport@TroopWebHost.com.